The KLF were the band who ruled the charts in the late 1980s and early 90s, then bowed out of the music business by famously burning £1m of their earnings. Now Jimmy Cauty and Bill Drummond have a new project - building a pyramid using bricks containing human remains. 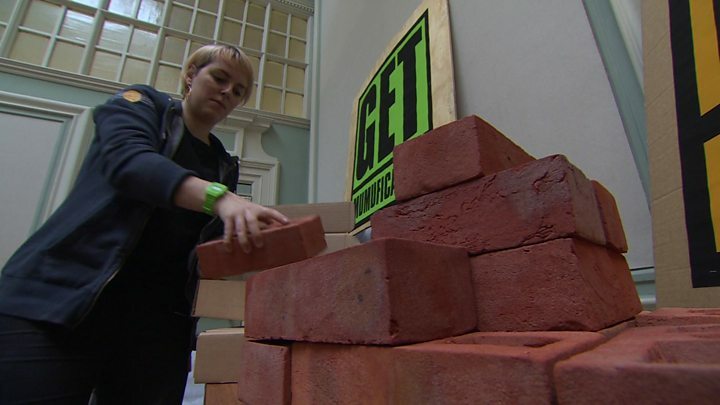 The pyramid's first brick, which was laid on Friday in Liverpool, contained the ashes of Cauty's artist brother Simon, who killed himself in 2016. "I think it's a really fitting start to the whole project," Jimmy told the BBC. The pair staged a ceremony in Toxteth to lay the brick on the foundation stone, and invited other people to sign up to have their cremated remains sealed in their own brick after they die. The duo will need 34,592 bricks to complete the ambitious plan - which Jimmy Cauty admits could take around 300 years. "I guess we're still a band as well," he says in a rare interview. "It's interesting to be in a band that doesn't make records but only makes pyramids of dead people. "It's easy to make it sound like a joke but it isn't a joke, it's deadly serious and it's a long-term project." The band, who announced themselves in the charts with a number one as The Timelords in 1988, became known for their incendiary stunts as well as for their electrifying pop-trance hits. After burning the £1m on a remote Scottish island in 1994, they made the resulting ash into a brick. "It was on seeing that that I decided I wanted to be made into a brick after I die," Jimmy says. The band also have a fascination with pyramids - there was one in the KLF logo - and at one point hoped to build a pyramid containing a brick for every person born in the 20th Century. But the idea for building a pyramid to commemorate the deceased came after Simon Cauty's funeral, which Jimmy says left him feeling as if there should have been "something more" to mark his death. "He would really love the whole notion of being the first brick in the pyramid," Jimmy says. "He knew that I wanted to be in a brick, right back to the '90s. It's a positive ending, and a positive beginning." Simon Cauty, from Kingsbridge, Devon, worked closely with his brother and Drummond, helping them to create some of the sets and props for their elaborate videos and live shows. "We had a very close creative relationship," Jimmy says. "I'd say to Simon, 'Could you make for Bill and me a ceremonial horn that we could wear in the video?' And he would instantly know what that was and we wouldn't have to explain it to him. "Or I could say, 'Look, we've got a Viking ship, could you make it look like it's just come all the way to America?' And he would just do that. "I loved the things he did and the way he did them. Because we shared the same DNA, we had the same creative vision, so he's sorely missed." Explaining why being turned into a brick might appeal to others, Jimmy says: "Do you want to just disappear in a puff of smoke, or do you want to be part of something that is left behind? "This pyramid could last for maybe 1,000 years. It's interesting to think that you could be part of something that could last for 1,000 years, even though nobody knows who you are or what your name is." Each brick has a hole in the centre to hold 23g of cremated remains, which are sealed when the brick is fired. They have called the process MuMufication - a reference to the group's current name The Justified Ancients of Mu Mu as well as a play on "mummification". Fans queued on Friday to get in to Toxteth Town Hall, where they could sign up for MuMufication for £99 - or, to get the process moving, 99p if you are over 80 and live in the local area. Cauty and Drummond do need to find a permanent home for the 23ft (7m) People's Pyramid, however. The foundation stone and Simon's brick are currently being stored at The Florrie arts centre in Liverpool. "I did get a message from The Florrie the other night after we'd left that the caretaker was worried that the brick was haunted," Jimmy says. "But I said it's highly unlikely because I think he's probably moved on by now." After a procession and ceremonial brick-laying on Friday, they have promised to stage an annual Toxteth Day Of The Dead to honour the pyramid as the number of bricks grows over the years. On 23 November 2017, the duo made the first in their series of public appearances in Liverpool to launch a novel. Cauty says they have been working in Toxteth for the past five years. But they are not working on new music - the pyramid scheme, which is being created with a range of local collaborators and Totnes-based The Green Funeral Company, has been occupying their time, he says. "This is the thrust of pretty much everything and has been for nearly two years now since the funeral of Simon. Our job in the near future is to communicate the idea to as many people as possible. It's a big project."